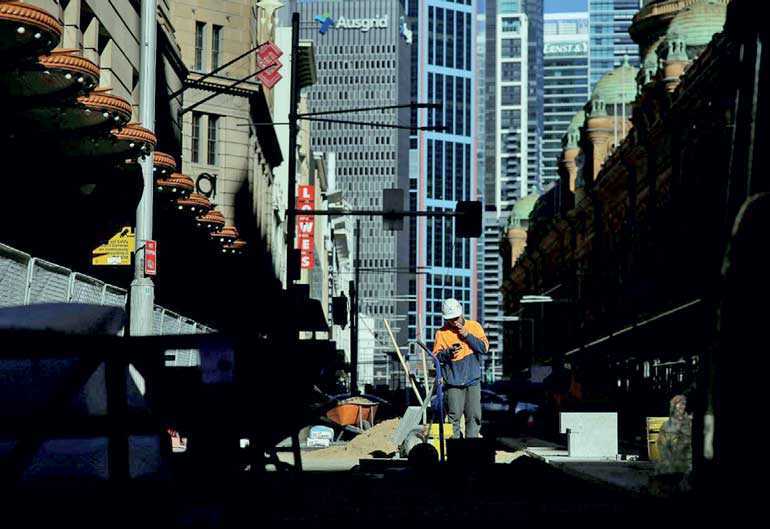 SYDNEY (Reuters): Australia’s economy sped past all expectations last quarter as rapid population growth fuelled demand for homes and infrastructure, while bolstering consumer spending in the face of painfully slow wages growth. Wednesday’s data from the Australian Bureau of Statistics showed the economy grew 0.9% in the June quarter, from the March quarter when it expanded by a rapid 1.1%. Gross domestic product (GDP) was 3.4% higher than a year earlier, ahead even of the 2.9% growth boasted by the United States. It was the strongest result in almost six years and handily beat market forecasts of 2.8% thanks to upward revisions of previous quarters. Investors reacted by driving up the local dollar up a quarter of US cent to $0.7215. “It’s a pretty good print for the quarter and with the upward revisions,” said Su-Lin Ong, chief economist at RBC Capital Markets. “The composition is encouraging as well. We’ve seen pretty decent domestic demand and reasonably broad-based growth.” The ruling Liberal-National coalition will be hoping the news distracts voters from the endless internecine warfare that saw Prime Minister Malcolm Turnbull ousted last month and replaced with former Treasurer Scott Morrison. Analysts fear the political dysfunction could take a toll on consumer sentiment, just as spending seemed to be making a comeback. Household consumption had rebounded in the June quarter to add 0.4%age points to GDP. Also adding to growth were net exports, home building and government spending. Fuelling that performance was annual population growth of 1.6%, more than double the developed-world average, as Australia attracted more migrants from China and India. Having more people has helped offset weakness in productivity that has bedeviled much of the rich world in recent years. That offset was evident in GDP per capita which grew only 1.8% in the year to June. Plenty of headwinds still loom, including a drought that has scorched the Pacific nation’s eastern farm belt. After a decade of feverish expansion, home prices are now falling across the country – a sizable drag on consumer wealth given the housing stock is valued at A$6.9 trillion. A recent hike in mortgage rates by Westpac stirred fears the other major banks would follow and pile further pressure on the housing market. So far, policy makers are unperturbed. Speaking in Perth on Tuesday, Reserve Bank of Australia (RBA) Governor Philip Lowe noted the average mortgage rate was still lower than a year ago and urged borrowers to shop around for better deals. The central bank has kept interest rates at an all-time low of 1.5% since mid-2016 and concedes they will have to remain there for some time yet. Lowe was concerned at developments abroad, notably the Sino-US trade dispute and the rise of protectionism. Two-way trade accounts for 44% of Australia’s GDP, while China alone takes around a third of the country’s exports.